Proper Hunt: Moving on up! So my dear friend, Alicia, recently moved into a wonderful, larger apartment. Before she moved in she had asked me to write a post on how to move from a smaller space to a larger space. My initial thought when she had asked me to write about this was, hmmm, don't people long to have bigger spaces just for that reason, to have a bigger space? How could there be a problem about this when that's what everyone wants? But then I began thinking about it some more (yes, I actually used my brain for this) and it made perfect sense. In fact, it dawned on me that I was facing that exact same problem! I just didn't see it that way when she had initially posed the question to me. I always thought, ooooh more space to fill with more stuff. The only problem with getting more stuff is needing/wanting more money. Ahhh money. Wish you had more of it, eh? Yup, I wish for it all the time. But I am a big believer in getting the best deals on everything. 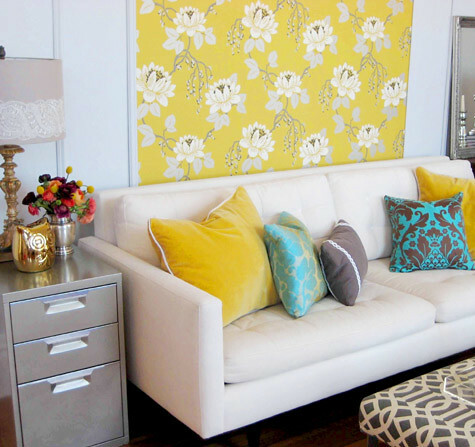 You just have to devote a little more time when you want to get a good bargain on something, especially when it comes to furnishing your home. A little can go a long way and I've learned that ever since I moved into my new house. We went from a 1 bedroom apartment in DC to a 3br, 4ba house and there have been a few tricks that I have discovered to creating a cozier, fuller house. Okay, okay I didn't actually discover them, but I did figure out which tricks to use, and with a tight wallet I might add. To Alicia and others out there moving into a bigger place, here are a few tips that will hopefully help you! 1. Paint, paint, paint! There is nothing more depressing than a blank wall to make a room feel even larger than it already is. The deep brown really warms the room and makes everything just pop. 2. Rugs. Now, they do have a practical purpose and that is to keep your toes warm but they also fill up the space visually and make a room feel cozy enough so that you can sit on the floor. 3. Wall Decor. There are loads of different types of wall decor you can use that are easy on your wallet, so there's no need to go out and buy an expensive oil painting, unless you want to invest in one that is. Photographs of family, friends, or places you've been to can all be used to fill up your walls with. You can even enlarge a photograph to make a statement in your space as shown below. Or how about Prints. 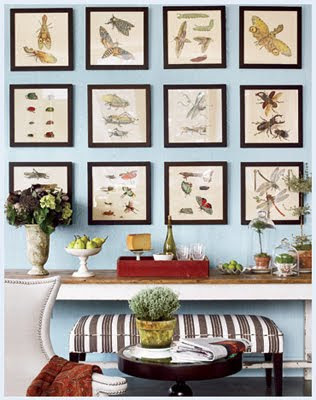 This grid of illustrative prints is an inexpensive way of displaying color and visual interest on a blank wall. Plates are also great items to hang up on the walls. They offer flexibility as to how you want to arrange them since you can display them in a horizontal or vertical line, arched, or in any pattern you want. One of my favorite ideas, Framed Wallpaper! Mirrors you say? Yes I do say. Now, I know that mirrors are used to create the illusion of a larger space but they can also be used to add drama to a room and fill a space as well. And who says you can't add all of those wall decor ideas together? Love the cluttered but structured look. 4. Seating is one of those things that usually eat up a home decorating budget. A sofa that will be used all the time is something that you should invest in. But aside from a sofa, you can really find budget friendly items that provide extra seating. Behold the Pouf. It really is a multifunctional piece that can act as a cushion, coffee table, or footstool. Floor cushions are another inexpensive way to provide extra seating without cluttering up your space with larger pieces of furniture. Black & Pink Suzani Floor Cushion from World Market for $39.99. 5. Fresh Flowers really add life to a room and make it feel like a home. You'd be surprised at how much a glass jar filled with $5 flowers can transform a room. Imagine this room without the flowers on the dresser, it just wouldn't be as nice now would it? And I really like how they echoed the orange color in the bedding in the flowers. 6. Same goes for Houseplants. They too add life and drama (depending on how large it is) to a space. Filling the space up isn't going to happen overnight unless you have a budget that will allow you to decorate the whole space in one go. Otherwise, it takes time and to make your space personal you want to fill it with pieces that mean something to you, right? Sometimes waiting until you find the right piece is a better idea than to have pieces you just feel so-so about. You want to love it, not like it. So evaluate what you've got (should you keep it or throw it away? does that chair need to be reupholstered? ), figure out how you want to use your space (game room or formal living room? should we highlight the fireplace or make the tv a focal point? ), then decide what items you are in need of and go out and get the best deal you can. Easier said than done, so if you are on a budget don't forget the great resources that are eBay, Craigslist, thrift stores, consignment shops, and neighborhood yard sales. These vendors are your best bet for finding some of the best prices out there. And pay attention to sales that are going on at retail stores too. You just might get a great deal on a piece you've been eyeing. Christina, I love this post! I got so many good ideas out of it. \nVolcanoes are a special feature on Mars because they suggest that plate tectonics may have played a part in shaping Mars' geology in the past. There are volcano chains on mars similar to Hawaiian island chain. On the rim of Meteor Crater are displaced boulders from lower depositional areas. This picture of Abraham Lincoln, taken by Alexander Gardner on Feb. 5, 1865, funny running shirts was once thought to be the president's last photo. The image shows a crack in the original family t shirts negative, 100 days of school shirt ideas which was broken and discarded in 1865. The last one, I definitely knew that the play couldn't be made. That's my playing style [to not go down]. I've just got to know, when somebody is on my ankles, it's probably not smart to keep trying to drag them. ".